Today, when you order "Marcelo Insua (Mr. 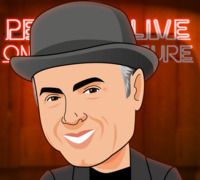 Tango) LIVE 2", you'll instantly be emailed a Penguin Magic gift certificate. You can spend it on anything you like at Penguin, just like cash. Just complete your order as normal, and within seconds you'll get an email with your gift certificate. Marcelo Insua (Mr. Tango) LIVE 2 (Penguin LIVE) Greatest hits countdown of the best gimmicked coin magic in the world! SUPPORT LIVE MAGIC. DOWNLOAD THE FULL LECTURE TODAY. 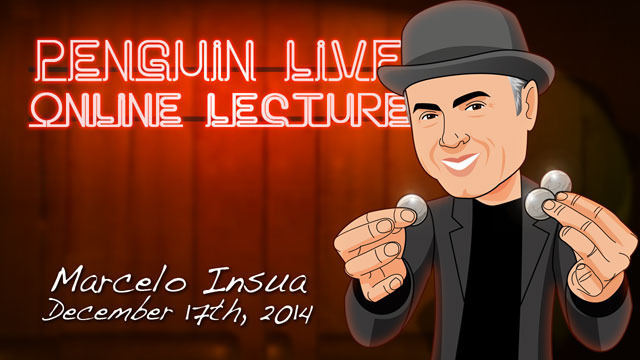 If you have even ONE of these gimmicked coins in your house, you CAN'T miss this lecture! Marcelo Insua, a.k.a Mr. Tango, is one of the most creative minds in the magic world today. He won the Invention Award in the last World Championship of Magic FISM 2012 in Blackpool, England. He founded the famous Bar Mágico, the only South American magic theater. 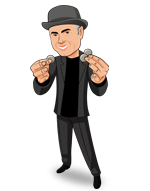 And, 12 years ago he founded Tango Magic, a factory of gimmick coins that has become the most prestigious in the world. Recently, just 5 months ago, Marcelo was elected as Outstanding Personality in the Culture of Buenos Aires City, the capital of his country Argentina. In addition to that, Marcelo has been touring the world for the last 5 years sharing his magic secrets, making stops in 25 countries and giving more that 200 lectures, including prestigious venues such as the F.F.F.F Convention, The Blackpool Magic Convention, The London Magic Circle, and SEI of Madrid. Aside from being a dealer lecture for Tango, it wasn't bad. If you are first getting into gaffs, this would be a good lecture to see all the gaffs and their applications. It was long and winded; I had a hard time paying attention and found myself dosing off at times. I'd consider this a dealer demo and nothing ground breaking that I could apply to my existing gaff routines. If you do any coin magic at all, any, then watch this lecture. Yes you would have to and should buy one of his TUC coins... and if you watch this lecture you'll be kicking yourself for not knowing about him or his coins sooner (if you don't already know) and you will want at least one. His TUC coin is better than any flipper, any shell, or any creation from Todd Lassen or Jamie Schoolcraft hands down. Not that TL or JS don't make great stuff, they just can't make this one coin unless they rip him off! It is IMFHO that this is the best coin gaff ever made. I'm selling my car just to buy as many dollar size TUC coins I can, so I can produce a s**t load of them with ease. I'd rather walk to a gig than not to have these coins. Also if you haven't seen his first lecture, just get it, it is full of other stuff besides coins (still has some coin stuff) and this guy is a genius in my book. A great ACAAN, chop cup with a glass, other card stuff and mentalism as well in the first lecture. This second lecture may seem or be a dealer lecture but you won't regret it. Again, if you like or want to do any coin stuff and learn simple routines that look like miracles, then this is for you! I have some gimmick coins from Tango and every gimmick is high quality. Thank you for perfect gimmick and for great card trick in lecture. Marcelo Insua (Mr. Tango) is by far one of the best creators and performers of gimmick coin magic. If you're into close up or walk around, you'll likely find several effects that you can use. However, almost all the effects require you purchase Tango gimmick coins, which may be relatively expensive, but comments suggest they are high quality. Although, I will likely only be using one of the many routines he presented, I still thought it was worth every penny for its educational aspects.